A couple times over the holidays, I used spray paint on a few household items… but truth be told..I wasn’t happy with the finish and the runny texture of the paint. Needless to say I was a little apprehensive to take on another project using spray paint. While spray paint has a lot of advantages; easy to use, covers well, and goes on quickly, not all home projects are suited for this style of paint. I feel its best application is for smaller items with intricate detail. For large pieces of furniture, I would choose latex paint, a more cost effective option. Here are gold candlesticks of mine that need to be freshened up. I have owned them for years and want to modernize them with a different color and texture. We use them mostly at Christmas time with burgundy candles. While they are pretty, I’d like a more contemporary look to use year round. 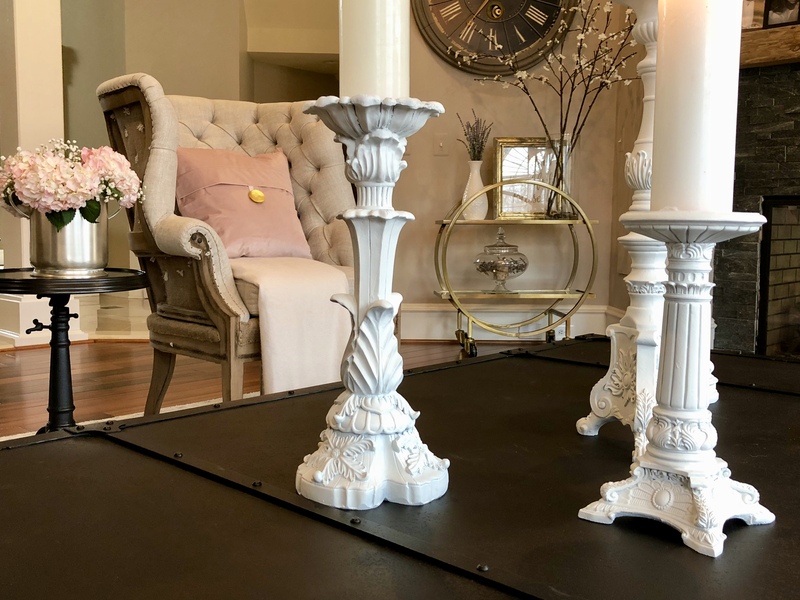 There is a lot of detail on these candlesticks, so using spray paint is the perfect option. For this project, I am using Krylon Chalky Finish Spray Paint in Classic White. I found it at Michaels and Hobby Lobby HERE, but had a hard time finding it in the color Classic White, must be a very popular color, it is also available HERE. I did not sand the candlesticks, but I did use a primer HERE, spraying one coat on lightly. This picture shows what they look like after 1 coat of primer. Make sure you are in a well ventilated area, I was in the garage with a door open, the paint does smell quite a bit. The primer dries quickly, but it is recommended to let your piece dry at least an hour before spraying with paint. I applied 2 coats of spray paint, and followed the recommendation to let them dry at least 6 hours between coats. I applied the coats quickly, moving the can left and right evenly down the candlesticks. The paint did not run or drip at all! I found this paint much easier to use than other spray paints I have tried in the past. The can also has a nifty spray tip nozzle that doesn’t tire your finger out like other spray tips, a definite bonus! The finish is very nice, a chalky flat finish. However, I did not find the finish to be ultra chalky. On a chalk finish scale of 1-10, I would give the finish a rating of 6 in terms of chalkiness. If you are looking for a high chalk finish, I would recommend using milk paint HERE. I found milk paint to have a much chalkier finish than this spray paint. Both are nice finishes, just depends on your preference. A chalkier finish will give your piece more of an aged appearance. All in all, I give this spray paint a thumbs up for ease, application, and finish. I will definitely use it again for future home projects. Thanks for subscribing to Happy Haute Home and following along on Instagram HERE. You can also follow along on Pintrest HERE, and Twitter HERE. See you next time! The candlesticks look beautiful. I have trouble getting an even coating when I use spray paint. You truly have a gift! They really did turn out goreous. It makes me want to give it a try!! Very nicely done. You definitely should! Was very easy to use, I was surprised. Those candlesticks turned out beautiful! Thank you, I was very happy with the result and so easy to do.